And it points to the future of the i brand. 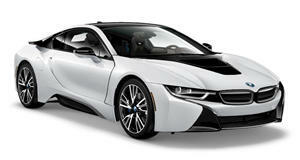 BMW created this i8 hydrogen fuel cell research vehicle back in 2012, and has been keeping it under wraps. Until now. Introduced at the BMW Group Innovation Days 2015, the futuristic-looking prototype has been used to test the marque’s hydrogen fuel cell technology that should be ready for large-scale production by 2020. Based on the new i8, the sports coupe has been kept lightweight thanks to its carbon-fiber construction, and come packing plenty of aerodynamic body parts. The most obvious stylistic change is the angular kidney grille and integrated slimline headlights, while large air ducts feed air to front-mounted radiators. Where the i8 has a 1.5-liter turbocharged three-cylinder gasoline engine, the research vehicle utilizes a fuel stack, powered by cryogenically-stowed hydrogen stored in a cylindrical tank mounted in the car’s platform, and oxygen provided by air. In turn, the fuel stacks provides electricity for a rear-mounted motor that generates 242 hp and emits water. You might recall BMW’s joint venture with Toyota. Among other things, the partnership was established to work on fuel cell tech. But plans are now being accelerated to get hydrogen fuel cell models into production cars in the very near future.